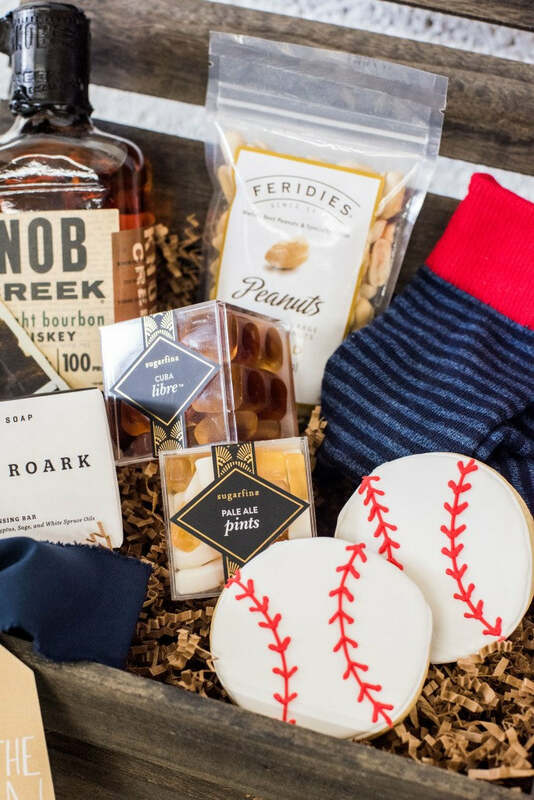 Finding amazing Father's Day gift ideas is tough so when Megan of District Desserts reached out to see if we wanted to partner on a Father's Day Gift-Away including National's baseball tickets, we knew we were in! 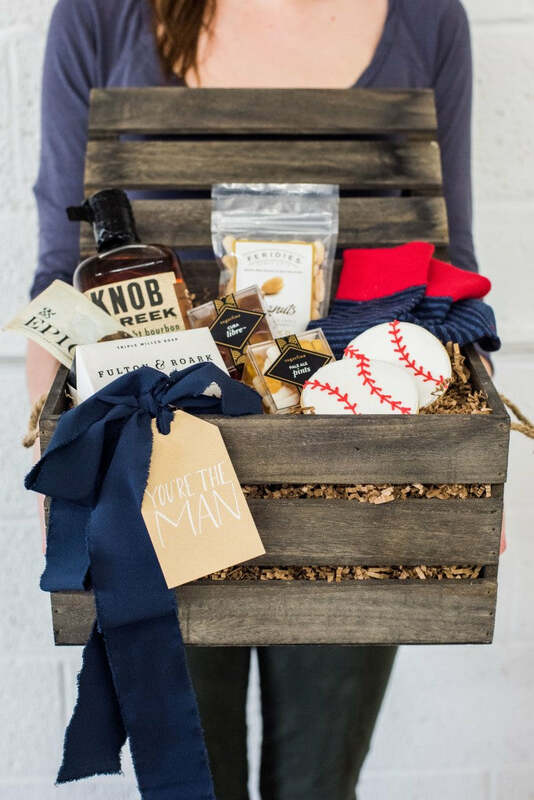 We designed a masculine gift box around the baseball tickets and are giving the gift away to one lucky Instagram follower! Around here, we do gift-aways, rather than giveaways, because we believe it's always better to gift than receive. If you’re the winner, we’ll drop-ship the gift to your recipient of choice! To enter the gift-away, follow @marigoldgrey and @districtdesserts on Instagram, like the post and comment why you should be the winner! Tag others for additional entries! The Gift-Away ends at noon EST on Monday, June 11, 2018. Winner will be announced on Tuesday, June 12. Father's Day is the perfect chance to celebrate the best guy in your life! Whether its a biological dad, adoptive dad, grandfather, father to your children, or any man who has stepped up in your life, finding the perfect gift for someone so special can be hard! To make it a little easier, we came up with a little formula to build the perfect Father's Day gift box and are so excited to share it with you! First, we started with tickets to the Nationals vs Orioles baseball game. But it doesn't necessarily have to be baseball tickets. We also love the idea of concert tickets, movie tickets, theater tickets or even museum tickets. Where ever you choose, the important thing is that you are spending time together! Gifting experiences are equally as special as gifts containing actual "things". In keeping with the baseball theme, we added a bag of local peanuts. As another quick snack, we choose an EPIC Protein bar. But you could really opt for any savory snack such as popcorn or even trail mix! 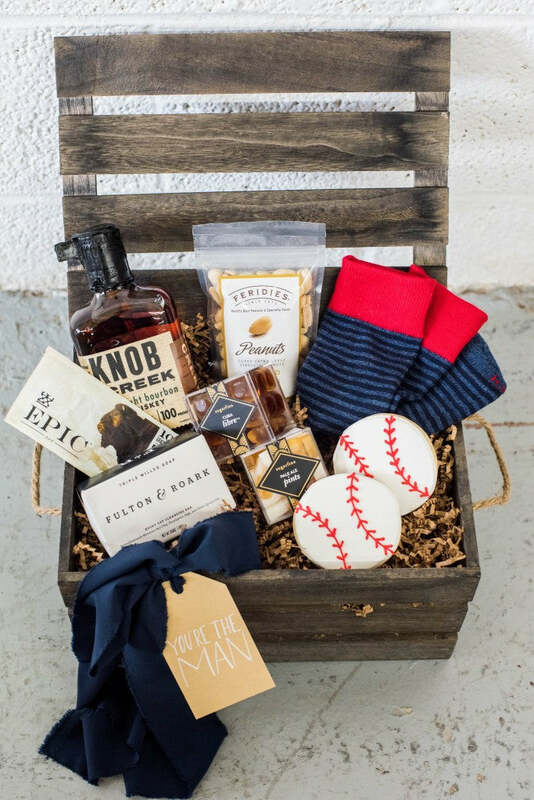 The real show-stopper in this masculine gift crate is a pair of District Dessert's custom baseball cookies. But let's not also forget the bottle of Knob Creek bourbon and two boxes of masculine Sugarfina candy. Lastly, we added a bar of men's artisan soap and a pair of navy and red socks. It's no coincidence that these are Nationals colors but if the guy in your life isn't a Nats fan, no problem! You can color coordinate with virtually any sports team as there are countless options for multicolor mens socks these days. Have fun with it! Voila! You’re ready to share the love with the guys in your life! To check out our full collection of ready-to-ship Pre-Designed Gift Boxes for all occasions, head on over to our online shop. Gifts in the shop have no order minimums and are offered with free shipping.